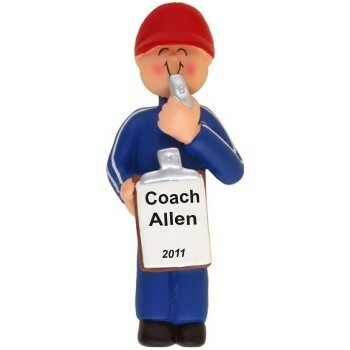 Show your appreciation to a coach who has helped you develop as a person as well as an athlete with the coach male personalized Christmas ornament that is handsomely crafted entirely by hand. These sports ornaments personalized as memorable keepsakes will be lettered on the front with his name and the year, and we'll add a special message to the back at your option. You'll let him know his dedication is worth the effort with the male coach personalized Christmas ornament that ships in our exclusive velvet gift and storage pouch.